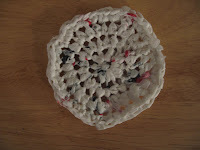 So my project this week was slated to be coasters made by recycling plastic shopping bags into yarn and then crocheting the yarn into coasters. Wow, I had missed crocheting! I'm not much of a summer crocheter. I'm not sure why? Perhaps I associate yarn with being warm and cozy and therefore shy away in the dog days of summer. I probably hadn't crochet or knit at all since April. Crocheting feels really good. The actually act lifts my spirits and simultaneously calms me down. Sometimes when I am effortlessly making a granny square I feel a connection with women throughout history and women all oven the world. I know that plenty of men knit too - but it is the images of women that seem to collect in my consciousness. I feel a kinship with these women which makes me feel connected to all mankind and makes me feel slightly more at ease. Even when the project turns out badly, I really love the process. I can't say that about many things. Sidenote: I had avoided crocheting with the plastic bag yarn because I believed I would hate taking the time to make the yarn by cutting the bags and weaving them together, however; I think this project was actually quite enjoyable. I curled up with some DVR'd Jon Stewart and made a big enough ball of yarn to make a couple of coasters in no time. I followed the pattern and created a perfectly fine coaster, in the sense that it is created to the patterns specifications and is indeed what I intended to create. Sadly, its just not something I would use. 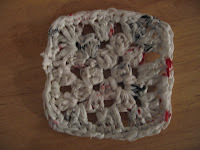 Just to be sure, I crochet another coaster prototype in a square - still a no go. I think the problem is that I for some reason view the plastic grocery bags as being a little dirty. Not filthy, but not clean enough to have near food. I just couldn't see myself passing a guest a coaster made of plastic bags. I think I would actually like a bag made out of the bags so perhaps I make one of those in the future. Your coasters are cute - I can see how they might not be the most functional though. Allison and I are trying to do you proud. We're still making kitty blankets for the humane society and we're going to granny square instruction from her aunt sometime.